It's tempting with 20/20 hindsight to giggle about bespoke single-task machines like the oddly-named Haywood 9000 Composite in the light of the all-purpose IBM Micro, which dawned at the end of 1981. 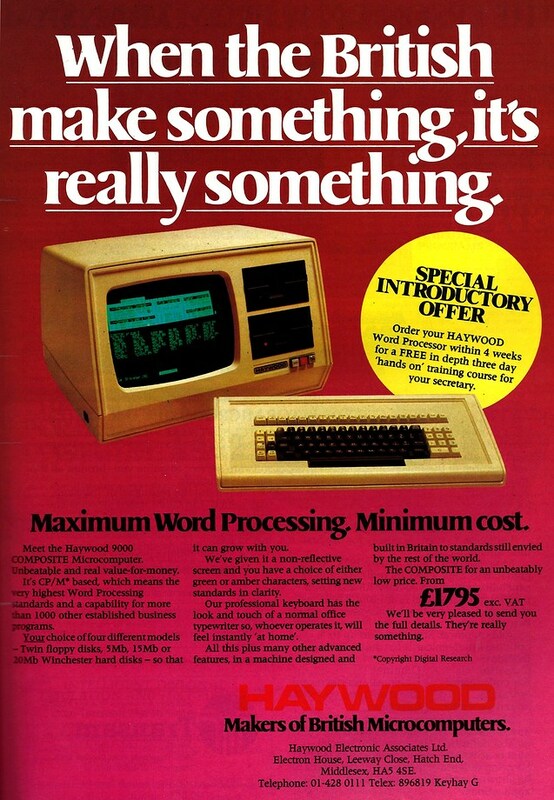 However, by the beginning of 1983 the IBM still hadn't appeared in the UK, so it wouldn't have seemed too irrational to launch yet another "word processor". This one was a CP/M machine which offered up to a 20MB hard disk drive and a non-reflective screen, with either amber or green characters. It retailed for £2,064 including VAT - about £6,940 in 2019 money. Despite being labelled as a "word processor", the Haywood was also a regular CP/M micro and could actually run "more than 100" other business programs. As a special feature, Haywood would even supply the Composite with up to 34 custom function keys, including a version configured just for WordStar.